Casey, Devoti & Brockland is proud to announce Partner Matt Devoti was again selected by the National Business Institute (NBI) to be a presenting faculty member for a webinar entitled “Auto Industry: Damages Bootcamp”. This is the third time in as many years that Matt and his fellow presenters have delivered this widely popular webinar, which previously aired under the title “Litigating Damages for Auto Injuries”. The newest iteration of this webinar will air nationally on Wednesday, January 23, 2019. As a member of the three-person panel, Matt will present two important segments of the lecture: “Necessary Documentation for the Extent of the Auto Injury” and “Negotiating and Litigating Auto Injury Damages: Plaintiffs’ Tactics”. Overall, this is the eleventh time Matt has served as a presenting faculty member for the NBI, which provides continuing legal education to professionals throughout the United States. A National Business Institute video webinar is a continuing education course where the participant attends sitting at their computer, where they can see and hear faculty as they present each topic. To find out more about upcoming NBI events, go to www.nbi-sems.com or call (800) 931-3140. 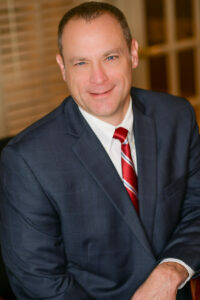 In addition to his 20-year legal career and his commitment to professional development, Matt currently serves on the executive board of the Gateway Chapter of the Cystic Fibrosis Foundation and previously served on the board of directors for St. Martha’s Hall, a shelter for abused women and their children. Casey, Devoti & Brockland is a St. Louis-based law firm focused exclusively on personal injury litigation. Since 1983, our attorneys have helped injured people navigate the road to recover by securing compensation for pain and suffering, medical expenses and lost wages. Together Partners Matt Casey, Matt Devoti and Anne Brockland have nearly 50 years of trial experience in the following personal injury matters: car, truck and train crashes, victims of impaired and distracted driving, medical malpractice, birth injuries, product liability, premises liability, elder and sexual abuse, Workers’ Compensation and wrongful death. We proudly serve clients throughout metropolitan St. Louis, southeastern Missouri and southern Illinois. recording his portion of the popular webinar.